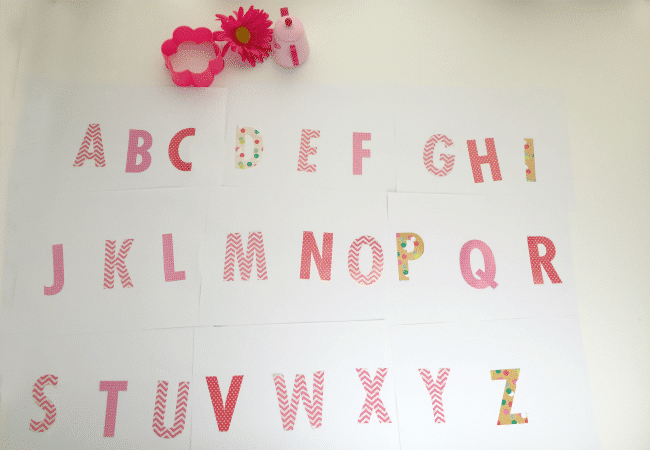 Create a Pinkalicious Alphabet Game for your preschooler. With just 3 simple supplies your child will be seeing Pink in no time! 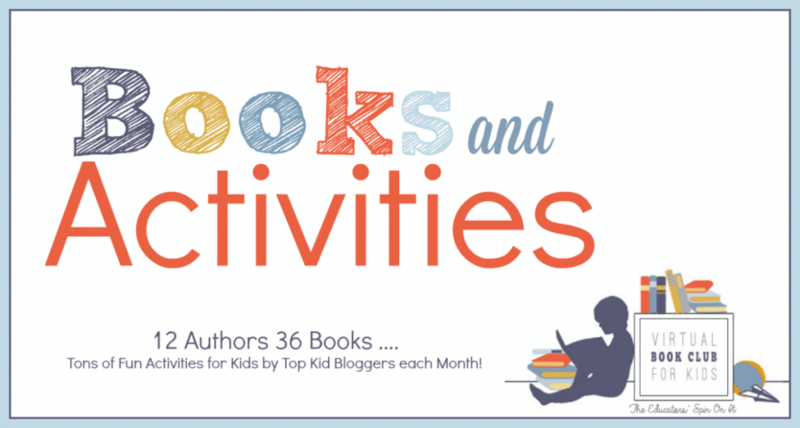 This month we’re featuring Pinkaliciouis for our Virtual Book Club for Kids book of the month. Are you ready for some Pink Fun? This post contains affiliate links to Amazon for easy online shopping. This month we’re featuring the adorable Pinkalicious book as our featured Virtual Book Club for Kids book. You could even make it a week long event and highlight some of the other books by these authors, Victoria Kann and Elizabeth Kann. There’s also Purplelicious, Aqualicious, Goldilicious, Silverlicious and Emeraldilicious along with many more from the author. You can see them all HERE. In the story more than anything, Pinkalicious loves pink, especially pink cupcakes. Her parents warn her not to eat too many of them, but when Pinkalicious does . . . she turns pink! This adorable picture book, filled with pink imagery and delicious pink cupcakes, celebrates all things pink while showing that being yourself is best of all. Reading it with your child might be a fun inspiration for a Princess Tea Party too! We focused on learning the letters of the alphabet with our Virtual Book Club for Kids Activity. First start with reading the story Pinkalicious. Have a little fun with your child and perhaps send them on a special hunt around the house finding all of the pink things that they belong. You’d be be surprised if you have a little girl how much there really is, so be warned. Now it’s time to create the Alphabet Sheets for the Activity. 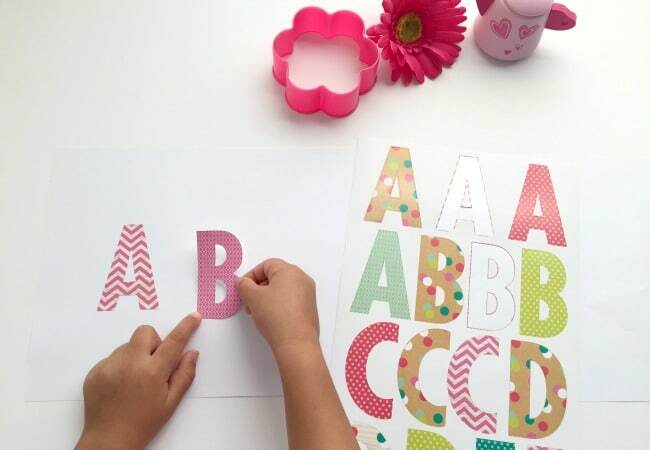 Have your child use their fine motor skills to peel the alphabet stickers up off the sheet and place t hem onto the paper. Place the stickers in alphabetical order to help your child practice this important literacy skills. If at all possible find a version of letters that have quite a few pink options so that they can search for pink, just like in the story. 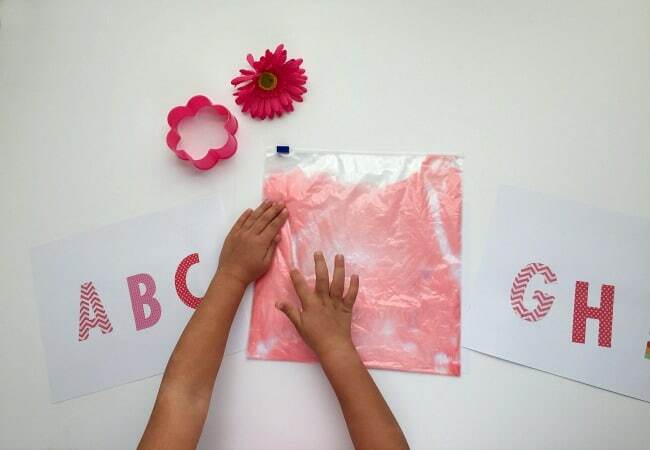 Once letters are all lined up on the sheets of paper you can create the secret pink sensory bag for the writing portion. To create this science fun with your child, use a gallon sized ziplock bag. Then have your child squeeze lotion into the bag. We used a few of those hotel lotions that we had collected on our travels. You could also use a cheap one from the dollar store or even shaving cream. The next step… TAKE NOTE IT’s a PINK TRICK…sneak in a few drops of red food coloring into the lotion at the end. Ask your child to smooth out the lotion in the bag to make it smooth and lay flat. As they push the lotion around they will begin to notice that the lotion is turning pink. You can totally do it with them knowing too, but the magic of turning something PINKn is pretty fun, just like the book. Once the lotion is smooth and flat in the bag you can lay it flat on a surface to use to write letter on. 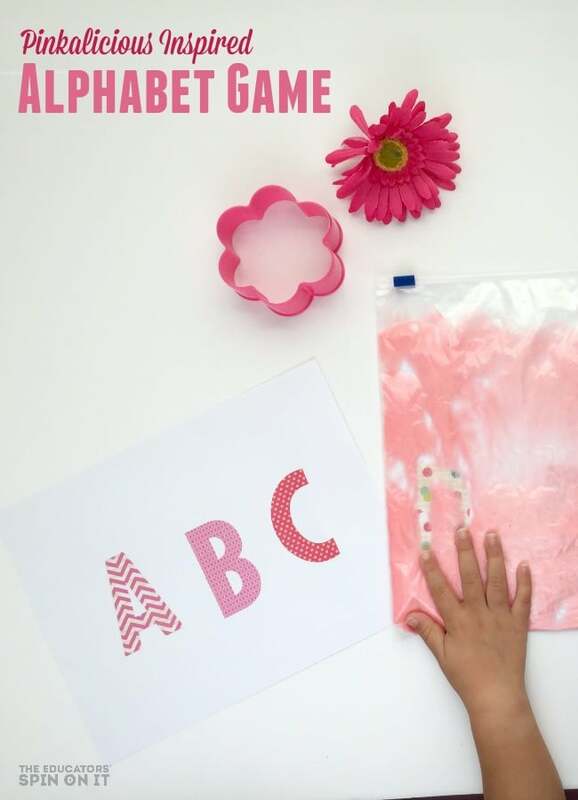 Last step is to help find the mystery pink letter by placing the bag on top of each of the sheets and practice tracing the letters below to help your children learning how to write their letters. 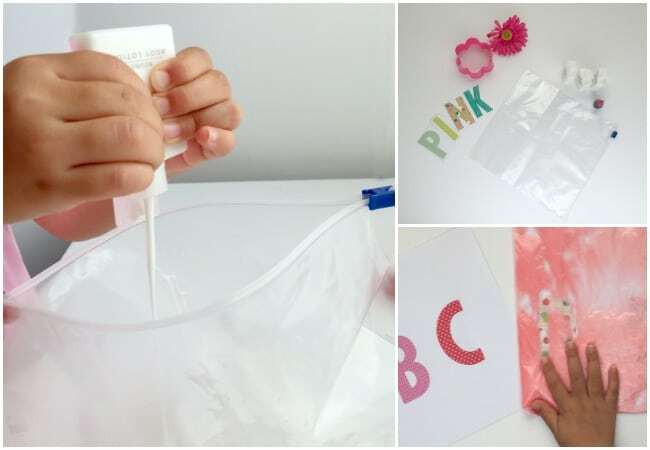 You can also use this variation suggestion as an activity to learn to simply identify the letters that they find under the pink lotion and call them out. **For older kids you could add word on the sheets and have them identify the ones that they find. Finish up your Pinkalicious fun with a fun pink drink or pink snack. We made some pink playdough to continue our Pinkalicious fun in the kitchen to work on additional fine motor skills too. Go to your local book store to pick up your own copy of Pinkalicious , order now online or visit your local library to check it out. Take a peek at this video read aloud of the story Pinkalicious on youtube from Barnes & Noble. Are you ready to see what the Virtual Book Club for Kids bloggers have shared to go with this adorable Pinkalicious book? Take a peek below and go visit their sites. Join the PINK FUN! Pinkalicious Roll and Count Playdough Cupcakes by I Can Teach My Child! Check out even more fun Pinkalicious Ideas on our Virtual Book Club for Kids Facebook Page and SHARE your own! Subscribe to the Educators’ Spin On It newsletter. Each issue has exclusive hands-on activities and games for children, a recap of our latest activities, and special resources selected just for you! What a fun way to work on letters. 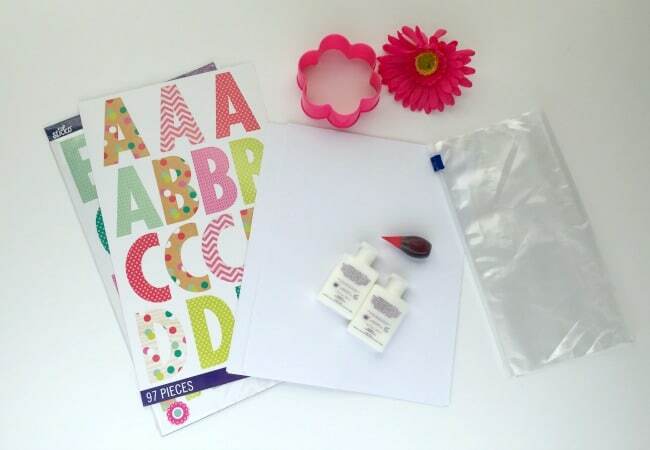 We love making these sensory bags but I’ve never thought to use them with the letter templates. I have created sensory bags using hair gel with different sensory items, such as glitter, foam letters, etc. This has sparked me to create these using family pictures to make a fun way for toddlers to identify their family members.